The Corsa VXR is the horsepower pinnacle of Vauxhall’s small car offering. It offers tyre-screeching power in a compact package. But with its central exhaust and extravagant bodykit, it’s not exactly subtle. In fact, it’s positively lairy. And for the more refined, it might not appeal. Which is where the Corsa SRi comes in. It is the sensible brother to the loutish VXR, with a more demure character and sensible clothes but still able to pack a considerable punch. A 148bhp punch, to be precise – 41bhp less than the VXR, but enough to put it on an even playing field with Ford’s Fiesta ST. The power comes from the same turbocharged 1.6-litre petrol engine found in the VXR, which will fire the Corsa SRi to 62mph in 7.6 seconds. For your money – £13,570 for the three-door version or £14,245 for the five-door – you get 17-inch alloys, a spoiler, deepened front and rear bumpers and side skirts, as well as uprated sports suspension over the standard Corsa. Although it doesn’t go to the visual excesses of the VXR, the SRi is still firmly on the performance side of the line, so fuel economy is hardly outstanding at 35.8mpg, while CO2 emissions are 189g/km. If that’s a little too ungreen, a diesel SRi is also available with a 123bhp engine that returns 58.9mpg. The SRi is not entirely without flamboyance, most obviously the bright red touches on the steering wheel and seats, and matching seatbelts. This makes for an interesting visual tone – a restrained exterior with a hint of what’s to come when you get up close. When you get the SRi out on the road, however, it’s clear that this businessman is far from the office joker. He’s the quiet, hardworking chap that blends in at the office but then runs triathlons at weekends. Make no mistake, the SRi has some serious grunt for a little car. Acceleration is just the right side of hairy, with plenty of excitement when the turbo kicks in but not enough to make you fear you’ll be spat off the road. The sports suspension makes for a firmer ride than the standard Corsa, but unless you have back problems it shouldn’t make for an uncomfortable ride. It does make for sharp handling, however. The chassis is very impressive, and only a back-to-back drive could definitively settle whether it has the edge over the excellent Fiesta ST.
One area where the Corsa beats the Fiesta is interior quality. Where the Fiesta feels on the scratchy, cheap side, the Corsa is full of soft-touch materials and some solid-feeling switchgear. So, for the boy-racer that’s grown up and got a sensible job, the Corsa SRi offers a less in-your-face alternative that can still provide bags of fun. The Renault is the cheapest to buy, but is also the least powerful with around 10bhp less than its evenly-matched rivals which offer around the 150bhp mark. It only has 16-inch alloys to the others’ 17-inch rims. 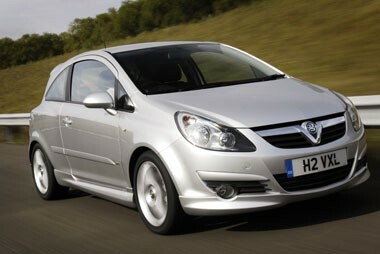 The 207 is most expensive, but does include a part-leather interior. Although the Clio is the least powerful it’s not the cleanest – that honour goes to the Peugeot, which will cost a 22% company car taxpayer £55 a month in benefit-in-kind tax. The Clio is second at £52 and the Fiesta third at £57. The Corsa will cost £62. For cheapness to service, maintain and repair the Clio is out in front. Smaller tyres and 18,000-mile service intervals mean it costs hundreds less than its rivals over a three-year/60,000-mile fleet life. 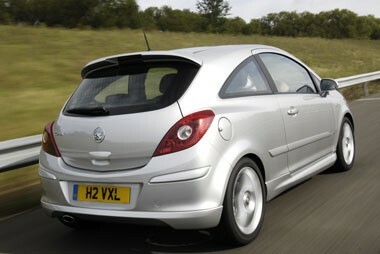 Vauxhall and Peugeot offer 20,000-mile intervals, while the Fiesta needs attention every 12,500 miles. The French know how to do economy, and with claimed combined economy of 40.3mpg the 207 is the most frugal car here, followed by the Clio at 38.7mpg. The Fiesta will return 38.2mpg but the Corsa can only manage a slightly disappointing 35.8mpg. As the cheapest to buy, the Renault will lose the least cash over a three-year/60,000-mile fleet life, despite a CAP residual value of 30%. The Fiesta has an RV of 33% and the Corsa 32%. The 207 has a 33% RV, but comes last because of its higher front-end price. Thanks to its lower purchase price and relatively frugal engine, the Clio is cheapest to run over three years/ 60,000 miles. The 207 in second place costs more than £800 extra to keep on the road, with the Fiesta close behind. The Corsa falls at the financial fences and is last. The Renault Clio is the cheapest to run, but is the most tepid of the warm hatches on offer here with just 138bhp. That’s great news for fleet managers, but not so good for drivers looking for a thrilling drive. With that in mind, the 148bhp Peugeot offers great value for money and power comparable to the Ford and Vauxhall, as well as the lure of luxuries such as part-leather seats. At only £800 more to run than the Clio over a three-year/60,000-mile fleet life, we think it’s worth the extra outlay to keep drivers happy, and therefore it’s the one we’d go for.